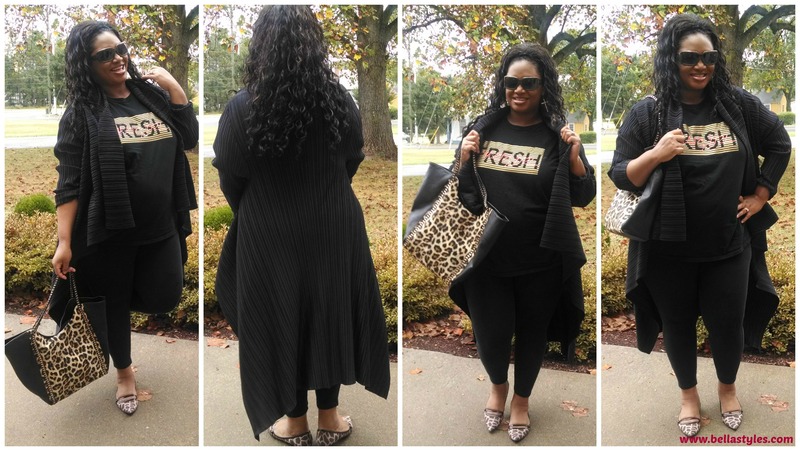 Earlier this year I got a chance to meet fashion blogger Maui of P.H.A.T. Girl Fresh. She is such a sweetheart. We met in Atlanta back in March and then saw each again in NYC this past June. Anyway in addition to her being a fab blogger she also has t-shirts repping her brand. (What a clever idea. Maui I’m taking notes, lol). Maui was generous enough to gift me a couple while I was in Atlanta. You may have seen me rocking the first one on my Instagram page back in March while in Times Square. But today I pulled out her signature tee with the name PHAT GIRL FRESH inscribed on it. This is my go-to shirt when I want a comfortable look for the day. Since Fall is basically here, or so I hope, it’s time to also grab those cardigans and jackets out of the closet. On cool days like this, I like taking day trips and this black long pleat jacket from I Dare To Be is gonna be in full swing this season for me. It’s long in the back and cascades in the front and can be fastened or worn loose such as I did. For days where you don’t need a heavy coat this one will suffice as its just right. If you’re a hippy woman these style of cardigans/jackets are perfect for your shape. 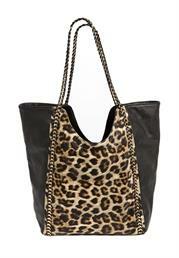 I simply added a great pair of leggings from Just My Size, flats and topped it off with an animal print hobo bag. This stylish bag is from Jessica London and is large enough to carry everything you need for a day out and about plus its in the best print ever, animal. Be prepared to see lots of animal print this season, especially from me. Love the outfit. It is so stylish and as you stated comfy as well! Check out Bella Styles OOTD, doesn’t she look great rocking her PHAT Girl Gear.